Marlene Dietrich's real name is Maria Magdalena von Losh. 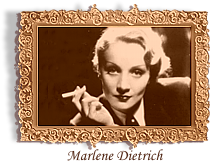 Marlene Dietrich was born on December 27, 1901 in Berlin the family of a Prussian officer and a rich jeweler's daughter. In her childhood she studied to play the wiolin, but because of the disease of the wrist she had to leave behind the musical career. In 1920, accepted the pseudonym Marlene Dietrich, and after a year began attending Max Reinhardt's studio school. Dietrich appeared in the shooting area to earn her living, but gradually she became raved about the cinema. It's true that the debutante's personal successes were completely modest until 1930 when the American director Joseph von Sternberg gave her a role in the picture '' Blue Angel''. This was the 18th film in the creative biography of the actress that actually became the beginning of her long and successful activity on the screen. Spectators went to the cinemas to enjoy the art of their favorite actress, Emily Yenning, and left the cinemas, moved from the exciting spectacle, spirit of which was a little-known actress with completely free manners and a low agitating voice. Sternberg showed the picture in Hollywood, and soon Dietrich received an invitation from ''Paramount'' pictures, whose owners decided to make this German a new Greta Garbo. Before letting Marlene Dietrich out to the shooting area, American specialists made a serious correction in her appearance. The new appearance of the actress in the film ''Morocco'' (1930), struck all, who knew her earlier. The carefully fixed wave of the platinum hair, the thin arched eyebrows, shining eyes, the hollow cheeks gave to Dietrich's face an expression of sorrowful and mysterious surprise. In this new appearance of the actress it was hard to recognize the former crummy German girl. And although in Hollywood Marlene Dietrich continued to create images of fallen women, they were molded of another material, presenting a new variation in the them of a mysterious fateful woman, who suffers from love and makes suffer others. The new star was appreciated deeply by the American society. For the role in ''Morocco'' Marlene Dietrich was advanced to the competition of reward ''Oscar''. Her best films in Hollywood (''Dishonored'', 1931; ''Blond Venus'', 1932; ''Shanghai express'', 1932; ''The Song of the Songs'', 1933; ''Devil-is the woman'', 1935) Dietrich created under Sternberg's direction. Their cooperation continued up to 1935, when because of the disagreements with the management Sternberg had to leave ''Paramount''. But Marlene's future career was continued in the outlined way, and only in the comedy ''Angel'' (1937) and the western ''Destri is again on the saddle'' (1939) the actress could depart from the usual images.